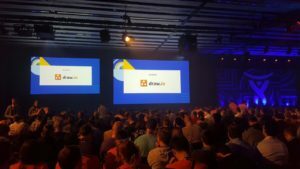 Just a short time ago, the keynote ended with the official opening of Atlassian Summit Europe by the co-founder and CEO Scott Farquhar. The Fira Barcelona hall was filled to overflowing. You could see on Twitter that some participants weren't even allowed to enter and had to watch the keynote on monitors. It's impossible to reproduce such an abundance of news and information in a compact blog post (and immediately after the end of the keynote). If you want to know all the details, just scroll through our live blog of Summit. Right now, we want to focus on the most important news regarding the Atlassian products. What Atlassian has in store for Trello, we still don't know. 😀 But a Summit keynote never comes without major feature announcements. Bamboo 6 is out and offers Configuration as Code. Available for Cloud for a while now: JIRA Software now also has Kanban backlogs in the server version. Portfolio for JIRA has been expanded by portfolio programs. All of the features announced at the last Summit have now been added to Atlassian Data Center products: zero-downtime updates, a performance testing framework (soon available for Confluence), Smart Mirrors for Bitbucket, Quickstart Guides for AWS, and SAML- Support. Now the product family will be expanded: HipChat Data Center and Crowd Data Center are currently in their closed beta phase and the public beta will soon be released. Features are differently prioritized by Atlassian across the deployment options (Server, Data Center, Cloud). Their cloud products are the testing ground where Atlassian gathers feedback and functions mature before they are delivered for server and data center (as per the previously mentioned Kanban backlogs for JIRA). Atlassian will continue to invest in all three deployment options, enabling customers to use the solution that fits their unique business and specific needs.